Marniosa lies just up valley of Cueva del Nacimiento, and is probably a feeder into the larger system. The entrance is a small 1m high fissure in the side of the hillside, where a cool strong draft emits constantly. Originally the cave was a cheese cave, typical of the area, and used to store the local cheeses, a particularly strong blue veined variety. However, beyond the old abandoned cheese racks, lies nearly 5km of cave from large dusty chambers in the higher entrance series, to an active streamway at around -230m depth. Marniosa was heavily explored in the late 70’s by Lancaster University Speleological Society (LUSS), but following a tragic accident, visits become less and the neighbouring Nacimiento cave was proving to be giving up its secrets far more easily. It wasn’t until the mid-80’s that a team from the South Wales Caving Club (SWCC) returned to Marniosa with the aim of exploring the undived sumps. This was a highly successful trip that not only dived the first sump, but also discovered nearly a 1km of passage beyond, terminating in a second sump pool. Initially, we wanted to transport some dive bottles to sump 1, ready for the divers, to dive sump 1 later in the week. A team of 4 assembled with various size bottles attached to their backs and other assorted bits and pieces. Normally a 45 minutes slog down the track to the cave is required, but now, with the benefit of a 4×4, we drove straight to the cave and only a short 5 minute climb to the entrance was required. All too soon, the cave changes again, with more muddy passage taking over and we knew we would be approaching the drop into the streamway. Papoose Pitch, as it is called, is a very muddy affair, with no real clean rigging possible and just a lot of mud to slip and injure something. At the bottom a series of platform are reached, that lead down via some exposed climbs, into the streamway. The active streamway makes a nice change from the rest of the cave, upstream in particular containing a lot of passage to a terminal chamber with a number of avens to be climbed. However, we were interested in downstream, so we set off again. It’s been a few years since I have been downstream in Marniosa, but I had forgotten how tricky some of the passage is, with high level traverses or exposed climb downs required for most of the 400m between the bottom of Papoose Pitch to Sump 1. There are 3 pitches in the streamway, again rigged last year, and there was a danger that winter floods might have damaged some of the rope, but luckily the first 2 pitches were fine. The third one was different. Not only was it rigged with deviations using maillons (ran out of carabiners), the core was exposed (found this out after I had already reached the bottom of the pitch). This will need re-rigging when we come back. Not long after this final pitch, the start of a series of swims marks the approaching sump. Gear was stashed here while Gareth took a quick jump into the deeper streamway to check out the sump. The Picos de Europa is a range of mountains 20km inland from the northern coast of Spain, forming part of the Cantabrian Mountains. It consists of three main areas, the Central, Eastern and Western Massifs. It was the Eastern Massif that drew the attention of Lancaster University Speleological Society (LUSS) in the early 1970s. The early years were spent pushing Cueva del Nacimiento (Cueva del Agua) located at the foot of the mountain range. Over the years this was pushed to around the 11km and +300m mark, but after several years the cave was abandoned as the major routes sumped and no continuation could be found. LUSS turned their attention to the Andara region higher up the mountain range and sought caves that would drop into the Nacimiento system and create a record-breaking 1500m through trip. They eventually found a number of deep caves around this ‘top camp’ area. Sara, Tere, Flowerpot and the -1169m deep Sima 56 (at the time one of the deepest in Spain) were all pushed to respectable depths. Many years were spent pushing the top camp systems but the way through remained elusive. In 2015 the Tresviso Caves Project spent 2 weeks exploring Cueva del Nacimiento and discovered new extensions above the Death Race 2000 chamber. The 2014 expedition partly climbed a promising aven, part way up the Teeth of Satan ramps. The aven requires completing with a possible continuation at the top. The Grand Circle is an area of passage around the main stream way at the far end of the cave. Although explored fairly rigorously in the late 70’s this was before the advent of more powerful lights and better equipment. Given the profile of the cave, exploration in this area would be worthwhile to try and find a middle dry phreatic level above the Far Upstream Sump. While on the diving, swearing and suffering was going on, a similar miserable experience was being undertaken by the a separate climbing team. Based up in the the Death Race 2000 aven, the plan was to attack one of the unclimbed avens, coming into the chamber. On the first camp the aven was scaled for around 70m high above the ‘middle’ of Death Race, a few diversions and detours were needed, moving into various alcoves and back into the aven. The boulder slope down the Death Race chamber was rigged, first to allow water to be gathered for the camp, but also to check for any leads at the bottom. At the bottom a small streamway was entered, known about by the 86 explorers. Upstream lead to a small sump and downstream lowered. 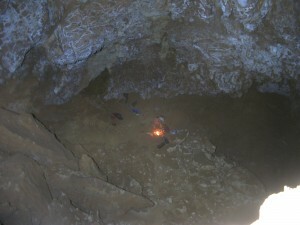 On the second camp the main aven reached a well decorated chamber. The slope of the chamber continues up and disappears out of site. Back in the stream way the narrows downstream were passed, into totally new ground. Over -150m depth has been gained and 700m plus of passage. Intriguingly the passage and water flows South West, which is the opposite direction to all other water in the cave….